Chris and I received a bottle of 2006 Stag Leaps Merlot as a gift last year. I think I have told you that the “Merlot” Varietal was the first red we both enjoyed and started our crusade to find more great wines!! While she was preparing the food to make dinner, I asked if she wanted a Sauvignon Blanc or Chardonnay? She immediately said Red please! She was not feeling a white this night. I wandered down to the cellar thinking what I could find that would pair nicely with dinner. 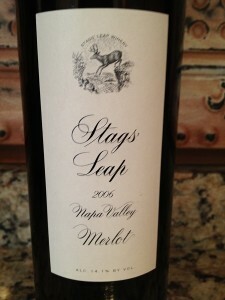 After a few minutes pulling bottles I came across the 2006 Stags Leap Merlot. This was the first wine I have drank from Stags Leap at home. I have driven by the Stags Leap winery a numerous times over the years. So I was looking forward to giving this bottle a try. I immediately cut the foil and pulled the cork. As usual I gave the cork a quick look and put it down. I had my two glasses and tasting sheet ready. 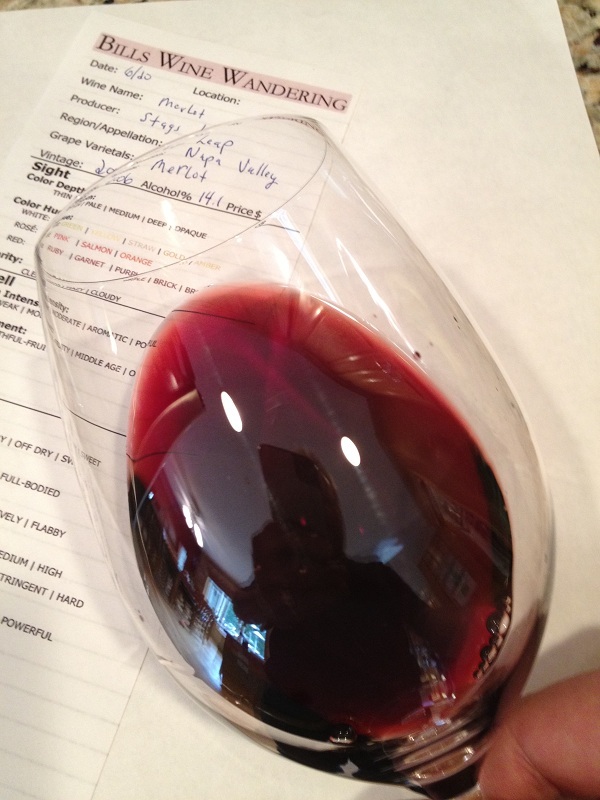 Pouring the 2006 Merlot into our glasses I immediately noted the purple to bricky color. The bottle was showing middle age. I was really happy to see the edge of the Merlot was bricky to clear. The color depth was clear and I did not notice any sediment in the glass nor the bottle neck. The aroma of the Stags Leap Merlot was moderate and had that middle age smell to it. If you have smelled an older wine you will understand what I mean. Some of the aromas we smelled were Cherry, Bilberry, Red fruit. Overall, it had a nice floral nose to it. Tasting the wine was nice. It was not dry. The Merlot was medium bodied and the acidity was in check. 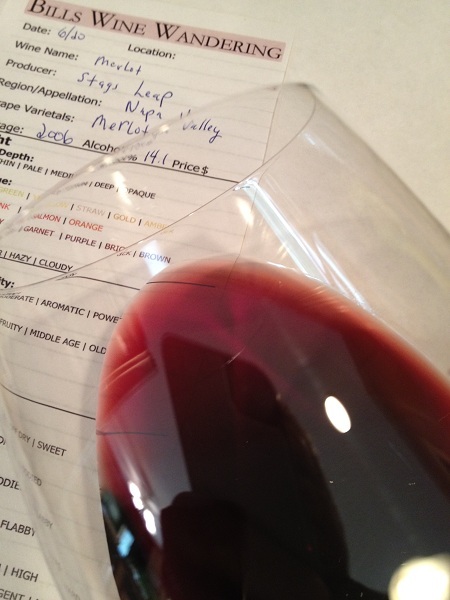 The tannins were medium and soft and were felt in our mid palate. As we tasted the Merlot the flavors were predominately Blackberry. It was very flavorful and the finish was medium. We rated the 2006 Stags Leap Merlot four glasses.